The mages of the Starry Orders of Ikthar, at the heart of the Silvery Principalities of West Aldar, are famous as astrologers and keepers of the secrets concerning the Six Orbs and the Wall of Stars. You have great knowledge of the power behind the major constellations, and can prepare your spells using the arcane position of the stars. Benefit: If you have access to the night sky, you can prepare your spells without referring to your spellbook. You substitute the heavens for your spellbook. You can only prepare spells in this fashion if they are first written in your spellbook. Normal: Without this feat, you must use a spellbook to prepare all your spells, except read magic and those spell selected for the spell mastery feat. * In the setting of Chronicles of the Seventh Moon, each one of the seven planets is treated as a different “plane” for all mechanical effects. Spells like plane shift are renamed to planet shift (or journey to other orb, as called by magic-users of the moon of Isaldar) Other dimensions of reality (what are called planes of existence in other settings) are very hard to reach and often lead to unique, strange and mind-shattering realms. Because of this characteristc, the skill Knowledge (Planes) is used also for astrological purposes. A first it all you can see is a flash of metal or mirror falling from the sky. This bird of prey has feathers the color of metal, with a motled, naked head. Its talons and hooked beak are like rusted iron. Charm Immunity (Ex) An iron vulture is immune to charm or compulsion effects. Resistance to Diseases (Ex) Iron vultures gain a +2 racial bonus against natural diseases. Piercing Strike (Ex) An iron vulture’s natural attacks ignore any armor bonus derived from metal armor. Iron Feathers (Ex) An iron vulture’s feathers are supernaturaly resistance against metal weapons and shine as polished steel under the sun. When faced under an open sky, during the day, an iron vulture’s feathers impose the dazzled condition for 1 round on any adversarie who fails a Reflexes save, DC 15 (Constitution-based ability). Iron vultures are infamous carrion feeders and a common sight after great battles. Many see these birds of preys as servants of the gods of war and carnage, sent to devour the armored bodies of warriors and take their spirits to the Outer Realms. They are carnivorous but also need of a constant diet of blood-bathed iron, which explains why they’re naturally attracted to battlefields or places of great slaughter. Iron vultures are not spirits or outsiders, but living creatures, albeit ones with a magical origin. Many believe they’re created by an old civilization as some kind of living plague or weapon. Some sages and minstrels of the wastelands speak of agonizing realms and city-states whose skies were full with “razor-sharp feathers of iron and blood” in their last days. Looks like the new patronage project from Open Design is Dark Deeds in Freeport, by none other than Chris Pramas himself (and, of course, Wolfgang Baur). As usual, patron slots for the project will start at $24.95 for Basic-Level Patronage. Dark Deeds uses the Freeport Companion: Pathfinder Roleplaying Game Edition. 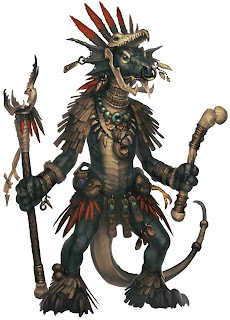 As I said in the previous post, I want to use the Table 1-1 (Monster Statistics by CR) of the Pathfinder Bestiary to generate, quickly and without much fuss, creatures for my 10th level campaign. I want to create stats for lesser monsters, of the kind you face on random encounters or just by exploring a region (like in a “sandbox” scenario). High-CR monsters have too much stats. If you know exactly what you are looking for (ex: a behir, an adult green dragon etc), that’s not a problem – just open the Bestiary. But sometimes you want something more generic (ex: a stupid draconic beast, some ogre raiders to put against high-level PCs etc.). For the last case I’ll try to use just the Table 1-1. In that table, you have 11 stats: CR, Hit Points, Armor Class, High/Low Attack, Average Damage (also High/Low), Primary and Secondary Ability DC, Good and Poor Saves. We can changes the values above, if a creature is particulary strong, weak, tougher etc. For Touch AC and Flat-Footed AC I want something simple. Removing any math. This creature is supposed to by a quick encounter or a lesser foe in a fight with the bigger boss. Let’s use half the AC number for both values. For Avarage Damage I’m thinking about having 2 values for each monster attack. If I roll even on the dice, I pick the lower number; I if roll odd, I pick the higher. Simple. The Ability DC I can use for any special attack or ability: gaze, breath-weapons etc. The Saves are the easiest. For example: if it is a slow or big creature, I’ll probably use the Poor modifier for Reflexes. Ok, now we have a lot less numbers to deal with, but we’re still missing a couple stats. In particular, I want Ability Score Bonus, Skill bonus, CMD and CMB. Ability Score Bonus: I believe I could use half the CR of the creature as their “good” Ability Score modifier, and ¼ for the other modifiers. This is not something accurate, but I can change this number for special strong, dumb or slow monster “on the fly” (yes, I like “DM’s call” a lot). Skill Bonus: First we divide the creature’s skills: Relevant Skills for important abilities likely to possessed by the monster (like Climb and Survival for our desert ogres); and Lesser Skills for other checks. Relevant Skills uses the creature’s CR + 3 + Good Ability Score bonus. Lesser Skills uses half the creature’s CR. No ability score bonus. CMB: I’ll use the creature’s High Attack stat. CMD: The creature’s High Attack + 10. Looking at the numbers above, I seek balance a few things. I’ll give my ogres 2 attacks at +11, to better distribute their damage values (too high for me, because these monsters are minor opponents of the party). I also want to increase the ogres’ CMB and CMD. After all, they’re supposed to be big and dangerous creatures in close fight. So I’ll add the Good Ability Score bonus to both values. - First I give them Reach (10 ft.) and the ability to execute the Grapple maneuver without provoking AoO (let’s call just Grapple ability). - I’ll give them a Stun ability. If they deal more damage than the target’s Constitution, he must succeed at a Fort save or be stunned for 1 round. - Can grapple without provoking an AoO. - Stun: if 1 attack deals more than the target’s Con ability score. Fort Save or stunned for 1 round. I know these ideas are far from perfect (very far), but I hope they can help other DMs in some way. This blog (my first one) is meant first as a way to better my (poor) English skills. Second, as a place where I hope to post a variable amount of material (of doubtful quality, I sure) from my Pathfinder RPG campaign. That is, if I’m not begin to ramble about related topics. If everything goes fine, I’ll begin to better edit and organize this thing.